Why, why have I never had spaghetti squash until now? I mean, I have heard it was good, I have seen recipes and all that but it just never interested me. But then it was on sale at the co-op and there was a small one, just big enough for one two-person meal, so we decided to give it a try. We didn’t even use a recipe, just looked up on the interwebs how to cook it. So easy really. All you have to do is cut the squash in half, remove the seeds, and put the squash cut side down on a baking tray. You can add a little water to the tray if you want to, we did, it makes the squash soft and tender. Then cook in the oven at 400F for about 30 minutes, until the squash is soft and you can stick a fork in it all the way through to the peel. To make the spaghetti, rake a fork top to bottom gently across the squash. The flesh will come apart into strings like spaghetti. Pretty cool, really. 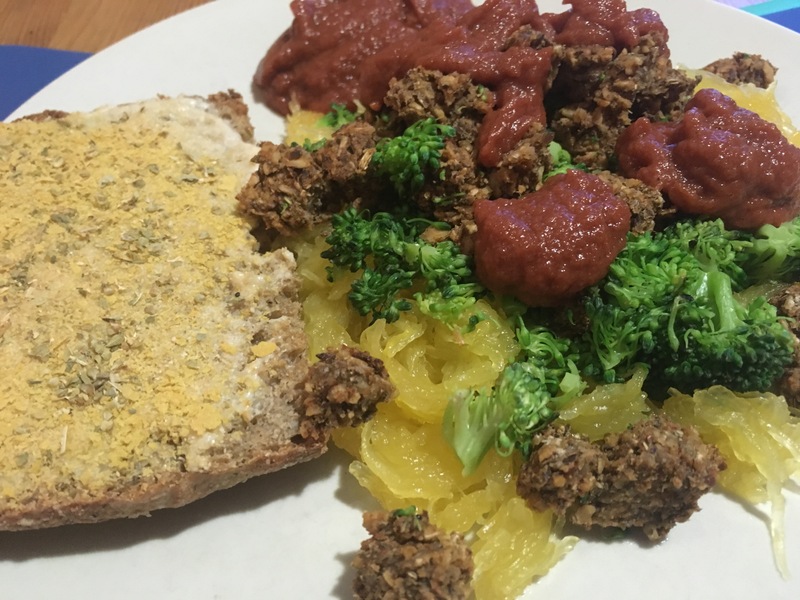 We dressed our spaghetti squash with crumbled oat sausage patties I mentioned in the lentil pancake recipe a few weeks ago. We added broccoli and a marinara sauce James made on the fly without a recipe. We had a little garlic toast on the side. It was filling and so very delicious and easy. I saved some of the seeds from the squash and plan to plant them in the garden come spring to grow a few of my own. That sounds easy enough to try. Jeanne, it is super easy and tasty! I love spaghetti squash. I am so glad that you discovered it. The consistency, when turned into “spaghetti” is amazing. It is a kind of food magic. I never get sick of it. Brian Joseph, I am glad to have finally tried it. I have no idea why I waited so long! It definitely is food magic. This is sooooo cool! I love Squash but I have never tried it this way! cirtnecce, like Brian Joseph said, it’s food magic. The flesh is solid until you cook it and scrape a fork across it create a pile of fine “noodles.” It has to be spaghetti squash though, this own;t work with other squashes. Spaghetti squash is one of my favorite vegetables of all time, and it’s really rare to find in the supermarkets over here. I always freak out and buy a bunch when it does show up. Loooove that stuff. Yey. That sounds like wonderful comfort food for cold winter evenings! My husband is not a very big fan of squash but maybe he’d like this. Will have to share with him! It looks delicious. I love spaghetti squash. Hahaha Yes, I completely relate to this “discovery”. It’s also so comforting and warming overall. Buried, yes! I am finding winter squash in general to be comforting and warming this winter. Such a versatile vegetable!